Google really wants the snapshots you take to have as much contextual information associated with them as possible. So much, in fact, the the Google Photos app can dip into your phone's location history (not just the GPS or other location data supplied by the camera app at the time of the shot) to tag it. At least one Android Police reader noticed that some of his photos had been amended with location data, despite the fact that he says he never turned the Save Location option on in the camera app. 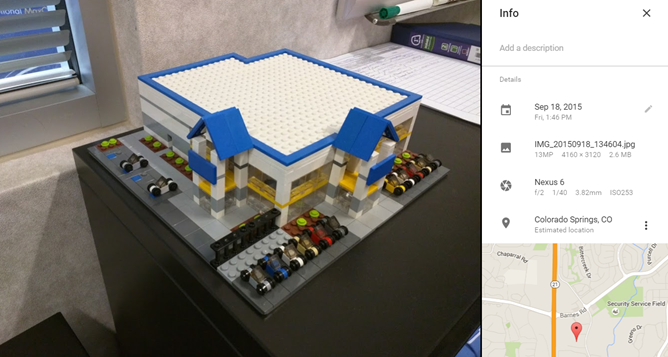 We did a little digging and found this support page, where Google's documentation says that the Google Photos system might "estimate" a location using your Google Location history tied to your account. That information was added without any particular fanfare sometime between October 2015 and today - cached versions of the page before October don't include the bit about estimated locations. Indeed, that seems to be the case - our reader even found some of the DSLR photos he'd uploaded to Google Photos supplied with a semi-automatic location tag, presumably based on the estimated nearby location of his phone at the time. For photos that do not have location information from your phone/camera, we now might estimate a location for that photo using information such as your Google Location History. Estimated locations appear to be tied to a city or other general geographic region, not a specific GPS pinpoint. Users who want to remove the location history can do so on a photo-by-photo basis in the Android app or on the web by tapping the Info button. If you don't want locations ever to be added to your uploaded photos, you'll have to disable Google Location History altogether. At the time being there doesn't appear to be a way to force the Google Photos system to estimate a location for a photo that doesn't have any associated info - it's all done in the background. Note that estimated photo locations added by Google aren't included in the photo's EXIF data, as it would be by the location added by the camera app itself.